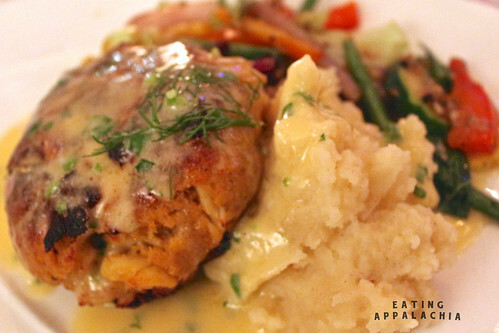 Oh, Downtown Roanoke Restaurant Week, why did it take you so long to come about and why are you so short? There so many restaurants in this town that I haven’t tried yet and your easy to pick from three-course menus make it all the easier. But thank you, Metro!, for extending your restaurant week menu for an extra week. Because of that you gave me a chance to rethink my first two impressions of you–and while I don’t think that you’re the best restaurant in town (by a long shot), I’m not completely averse to eating at you more often. See, there was this one night, a few months after G & I started dating, that we dropped by Metro! for a drink. I’d never gone in you before–the exclamation point on the end of your name a real turn-off (pretentious as all get out) as well as your freaky mix-match of Clueless era lights and bars, schticky red plush carpet and booths. (It’s true, I will never like actually being inside you until you get an updated interior–it’s so garishly dated.) But G talked me into it and I, foolishly, ordered a sazarac instead of an appletini or whatever uber bright, chemically cocktails you specialize in. That drink resulted in the first argument of my relationship–in public nonetheless–when G refused to let me tell the bartender that it was undrinkable (which it was–saccharine sweet with too much lemon, hardly any whisky). Needless to say, we didn’t go back for almost two years. And when we did, it’s really too bad to even talk about it, but we ate the worst meal I’ve ever eaten at a restaurant that’s supposed to be good. We paid extra for that dry aged steak and it came out overcooked (like burnt to a crisp, dry and brown as heck inside over cooked–we’d ordered medium rare) and it tasted…freezerburned. Like it’d been sitting around in the back of a freezer for two years old. The rest of the meal was uninspiring and oversalted. So we had no plans to return any time soon. But, thankfully, you ran your restaurant week menu that extra week and I figured, what the heck, I’ll give it a try. Glad I did. 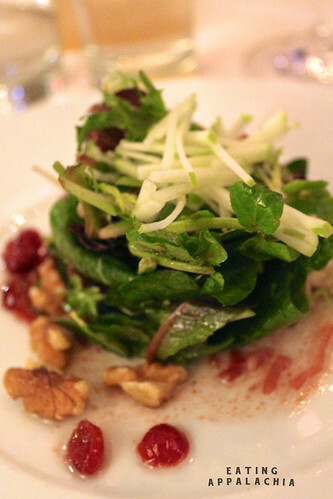 The Walnut Salad with Shallot, Cranberry, and Maytag Bleu Cheese was wonderful (if not a little sparse on the bleu cheese), it’s shallot vinaigrette light and bright, the cranberries adding a bit of extra tang to the dish. It’s a simple salad, one that’s on…well, ever menu on town…but I loved it and would order it again. 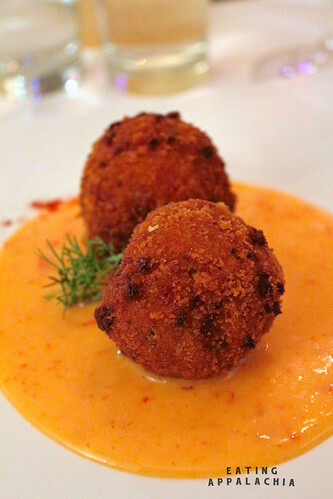 Another starter, the Pimento Cheese Fritters w/ Spicy Dipping Sauce might be in need of a new name (“Spicy Dipping Sauce,” really, did you have to give up that easily? Like what kind of pepper is in the sauce, for example? ), but was a fun, fried appetizer, the pimento gooing out of it’s fried shell, the mayo-based sauce weirdly creamy but a nice addition. I was pleasantly surprised at the kick in the sauce and found it to be an overall (simple) good dish. For our mains, we went classic: Jumbo Lump Crab Cake with Roasted Tomato Butter, and the 7 oz. 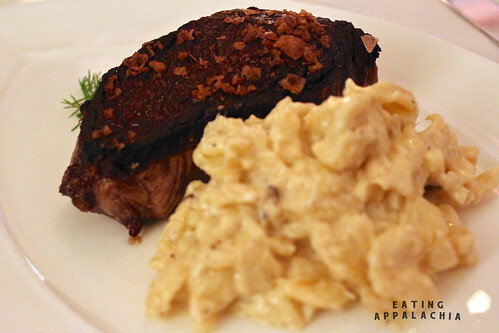 Prime Sirloin with Black Truffle Macaroni and Cheese. Funny story about the crab cake: our waiter, a nice, chatty (maybe too chatty, but, hey, people are into that thing in this town) guy, proudly mentioned that I would love the crab cake because it’s 95% crab meat, almost no bread, and held together by the egg. Well that’s swell! Except, um, hate to break it to you Metro!, but your crab cake was 75% bread, 25% crab meat. The tiny bit of crab meat in there was plump and rich, lightly seasoned, so that’s a good thing, and, thankfully, the bread wasn’t too shabby either–it had soaked up whatever spices and moisture is in the mixture–but you might not want to advertise a heck ton of crab when there’s hardly any in the dish. Don’t get me wrong, it tasted good, but it didn’t live up to expectations. As for the sides? The mashed potatoes were fine, maybe a little stiff, and the mixed sautéed vegetables were almost inedible from a cook’s heavy hand with salt. I liked the idea of them, but just say no to some of the salt, ok? The steak, thankfully, redeemed our horrid experience from late last year–cooked to a perfect medium rare, it was juicy with a good sear. An excellent classic steak. Hate to harp on the salt, but the large flakes of it on top of the steak were unnecessary, we ended up scraping most of it off. G seemed to enjoy the truffled mac and cheese, but since I’m not a big fan of (read: I’ve come to hate) truffle oil, I stayed away from it. A bite or two convinced me that most people would love it, and I appreciated the actual bits of shaved truffle (I mean, black truffles are wonderful, magical things! ), but I found the presence of truffle oil to be a bit overpowering (and fake). But let’s move on to dessert–shall we? I’m not going to harp on the boring, circa 1990 dessert choices–the options were the same on almost every single restaurant week menu in town–and, as far as they went, I enjoyed them more than another restaurant’s (which I didn’t write about on here–the meal was that bad). 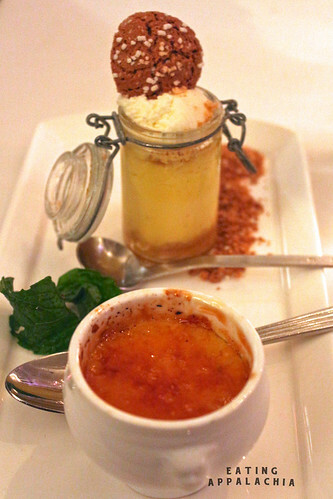 The Creme Brulee was a fine creme brulee as far as those things go. Before this restaurant week experience here in Roanoke I hadn’t had one in years (they’re boring, overdone) and this one was up to par. Only issue–the bruleed sugar on top was so thick that I had to ram my spoon (with quite a bit of force) into it to get it to break (it was 1/4″ thick and hard as ice). Once I got into the custard below, though, it was tasty enough. Two of my favorites were the Peanut Butter Pie Triffle and Raspberry Chocolate Pot de Creme. Again, standard choices, but you can’t go wrong with peanut butter or hot chocolate pudding. (Plus the peanut butter triffle was all mine given G’s allergy.) Loved the Luxardo cherries on the side of the pot de creme; I’m always glad to pop one of those in my mouth. 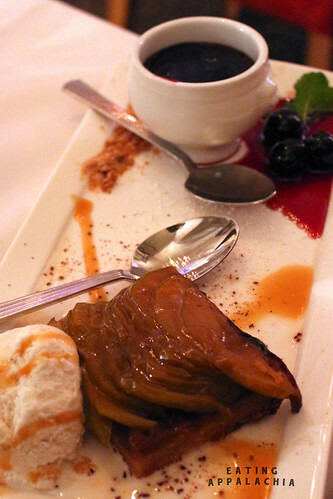 The Granny Smith Apple Tarte was nothing to write home about. I found it bland and the apples mealy, but G seemed to like it so I didn’t go past a bite or two on it. As far as it goes, the mini dessert format of the menu was appealing and I’d definitely say that you should keep it up–even on the regular menu, because who doesn’t love trying several different desserts?